May 8, 2011 Angela G.
Just as I take true joy in debunking the myth that real men don’t eat quiche, the same goes for soup. A dish of champions, soup can be hearty and nourishing, but also light and luxe, all at the same time. I love this soup because it’s the proverbial king of the aforementioned paradox – earthy potatoes are simmered with a homey stock, but then whipped to a smooth majesty of a soup. The top is kissed with truffle oil – again, another fabulous palette paradox – the earthiness of the truffle essence is delivered via the clarity of the oil. It’s all glorious, grand and a reminder that we shouldn’t waste a single second dining on anything less than awesome. This soup, given that it is thick and hearty, is an excellent base for braised short ribs as well. I first tried this soup in this manner at the Southern France-focused restaurant, Marseille, as a special plate to cut through the winter chill of the city. You can still eat it as they served it – a soup with a few shreds of the glorious meat on top. Or you can give in to your carnivorous proclivities and treat the soup like a pomme puree or elegant sauce to accompany the beef. I guarantee that either which way you decide to go, you’ll have a rib-sticking meal for even the manliest of men. Begin by adding your ham bone, stalks of celery (tops and all), chopped onion, bay leaves and water to a large pot. Bring to a rolling boil and then lower heat to medium-high. Allow to cook away until the ham has completely fallen off the bone and the stock has reduced to about 7 cups of liquid – about 2 – 2 1/2 hours. Strain stock and discard all of the solids. Taste for salt and pepper and season accordingly. Set stock aside. In a large pot, melt butter over low heat. Whisk in flour and cook roux for about a minute. Slowly whisk in strained stock so as to prevent lumps. Bring pot of liquid to a simmer. While stock is simmering away, peel your potatoes and chop into cubes. Add your potatoes to the stock and bring it to a rolling boil. Add the white pepper and nutmeg. Cook until potatoes are incredibly tender when pierced with a fork, about 20 minutes. For a chunky soup, mash the potatoes with a potato masher. For a smooth soup, puree with a hand mixer or in a blender. If you use the blender, make sure to do so in batches and always put a kitchen towel over the lid. This’ll keep you from splattering hot soup all over yourself, which is never ever a good thing. If you’ve blended your soup, return it to the pot. Stir in the cream and taste for salt and pepper one last time. Snip half of the chives into the soup and stir. 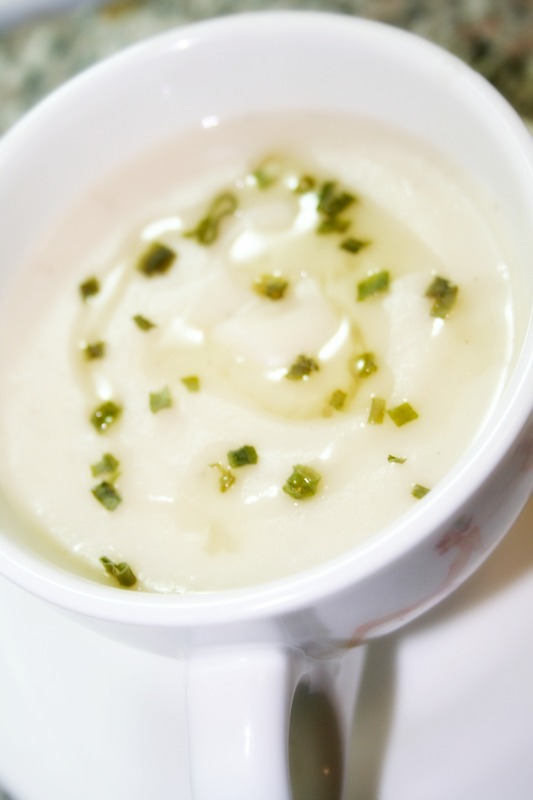 Ladle out the soup and top with additional snipped chives and a drizzle of truffle oil – white or black depending on what you can get your hands on. I call for yukon golds in this recipe, but plain old russets will do the trick as well. For a real treat, try an heirloom potato – Marx Foods sells them in all colors and textures, many of which would be so very well-suited for this recipe. Num num!